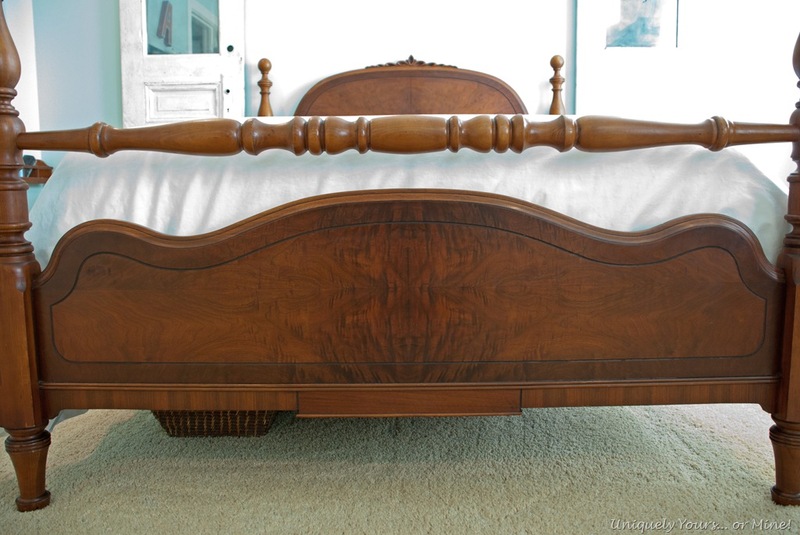 Beautiful Vintage Bed Makeover – Uniquely Yours… or Mine! Hey guys! Well I’m FINALLY working on a piece of furniture , it’s for Brie, but I am working on furniture! 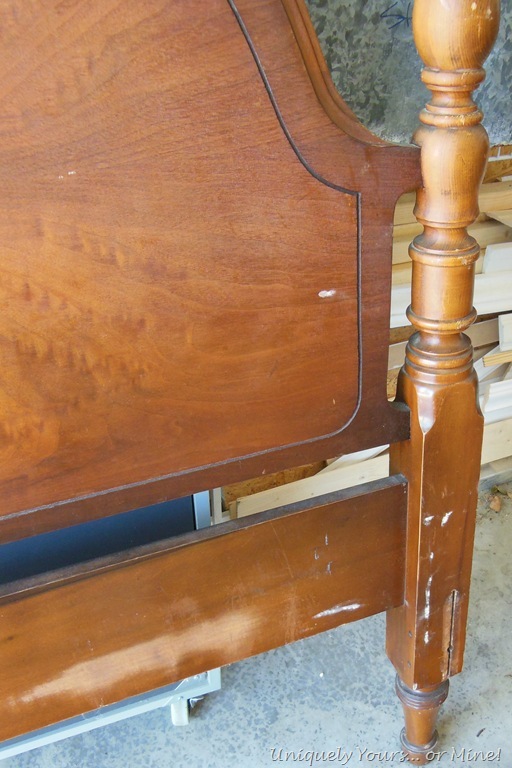 So I purchased a full size vintage wood bed off of Craig’s List for $125, which is not a bad price but not super good either (I’ll explain later). I had a heck of a time finding a “nice” full sized bed that would work for my youngest daughter, so when I saw this one come up I immediately contacted the guy. However, I didn’t put the entire bed together (wood rails) to ensure stability (bad, bad Susan), I just made sure that the rails were the right ones by testing them in the slots. Anyway, when I got started on the bed and put it together it was SUPER wobbly! I don’t have the skills necessary to fix it, plus one of the wood rails already had a REALLY bad repair done to it, so I decided to look for an alternative. I found this great US company STL Beds that make metal replacement rails for vintage beds (among other things). After printing out their template to make sure it would work with my frame I purchased the No.1 Full Hook Side Rails. Hooking them up was pretty straightforward, you are not supposed to use wood slats, and let me tell you this bedframe is now T-I-G-H-T! It doesn’t move or wiggle or make any creaking sounds at all, which my daughter is thrilled about! You could see a lot of wear on the rails. 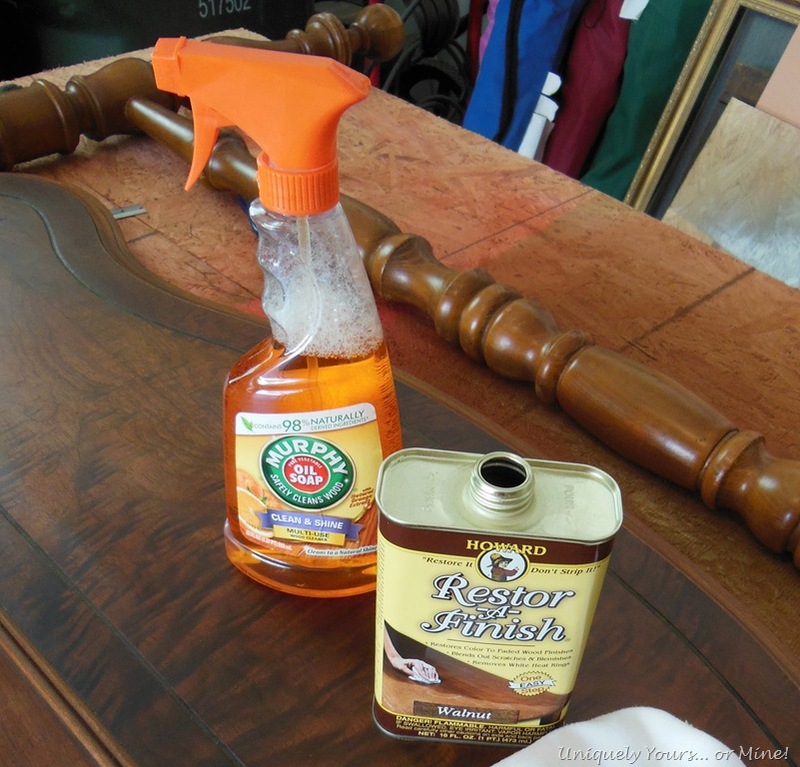 I used 3 products to clean and restore this bed, Murphy Oil Soap, Howard Restore-A-Finish and Howard Feed-N-Wax. Let me tell you I use the Murphy Oil soap all of the time to clean pieces I am going to paint or refinish. I smells great and cleans fabulously, perfect for cleaning out old smelly cabinets or drawers. My process was to spray the oil soap on the wood, scrub (with the grain) the wood with 0000 steel wool then wipe it down with a cloth until clean. This took me about an hour because the bed was filthy and had a lot of wax buildup on it. Below you can see the grey streaks of wax still to remove. After cleaning it I let it dry out overnight and then came back and applied the Restore-A-Finish according to the directions. The last step was to wax it with the Feed-N-Wax product according to it’s directions… BTW this stuff smells like oranges too! 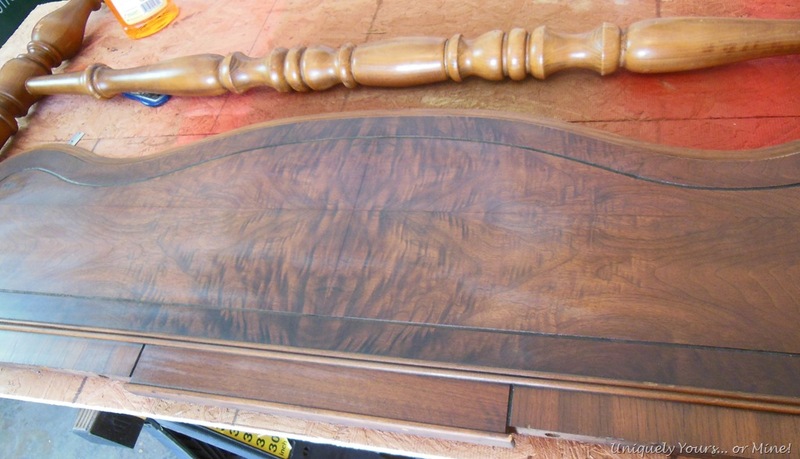 This is what it looked like after the Restore-A-Finish was applied. The bed is all set up now in Brie’s finished room (which I will share soon), it turned out even more beautifully than I could have hoped. 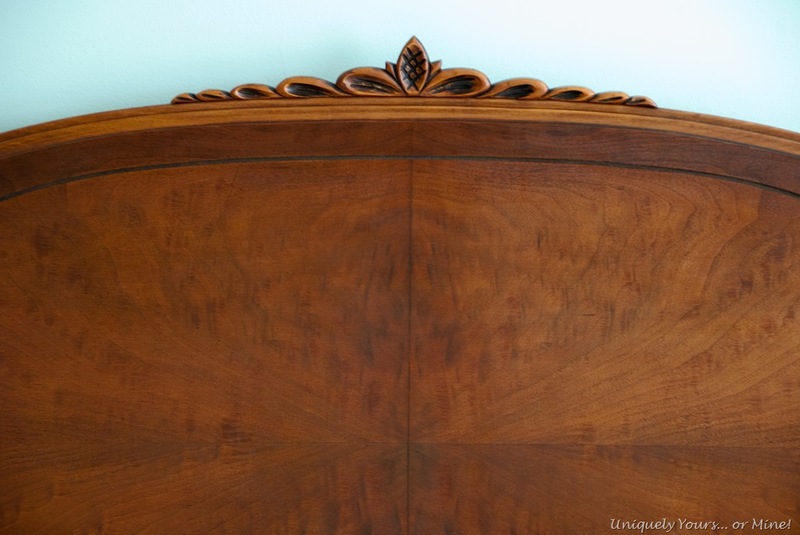 Just look at the gorgeous graining on the wood! It seriously will be a piece that she can use for years to come and hopefully pass down to her kids! I want to mention that a lot of the time you will see me painting pieces, but I don’t always. If the piece is salvageable and looks best in it’s original state then that is what I will do. I could NEVER had painted this piece after seeing the beautiful natural graining of this wood, but had I been unable to save the veneer then painting would have been an option. I hope you enjoyed seeing the transformation of this bed and I cannot say enough about how happy I am with the new steel rails I purchased for it! Let me know what you think! 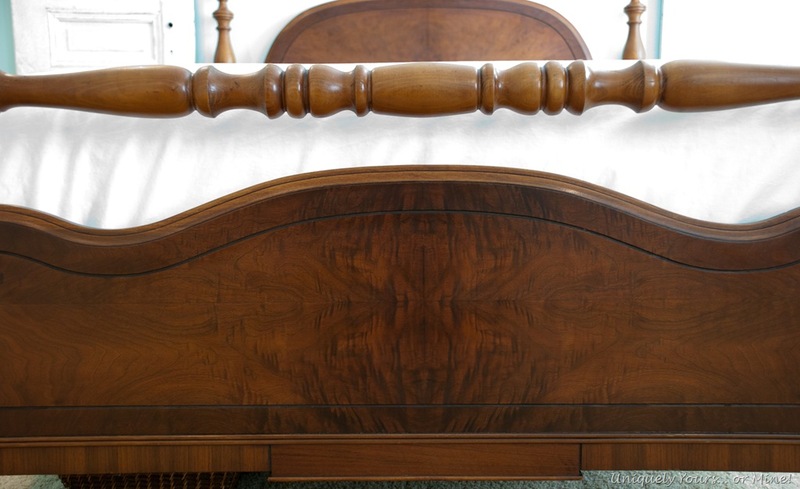 love the craftsmanship of the old wood beds. you just can’t buy that quality any more in the new products, which all seem to be made of plastic-like materials. I tend to paint everything, but I’m glad you took the time to bring the wood back to life in this case. That’s a gorgeous bed Susan! Thanks so much Sharon, I was glad I could save it! 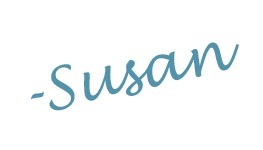 Susan…. your awesome… and your my savior. 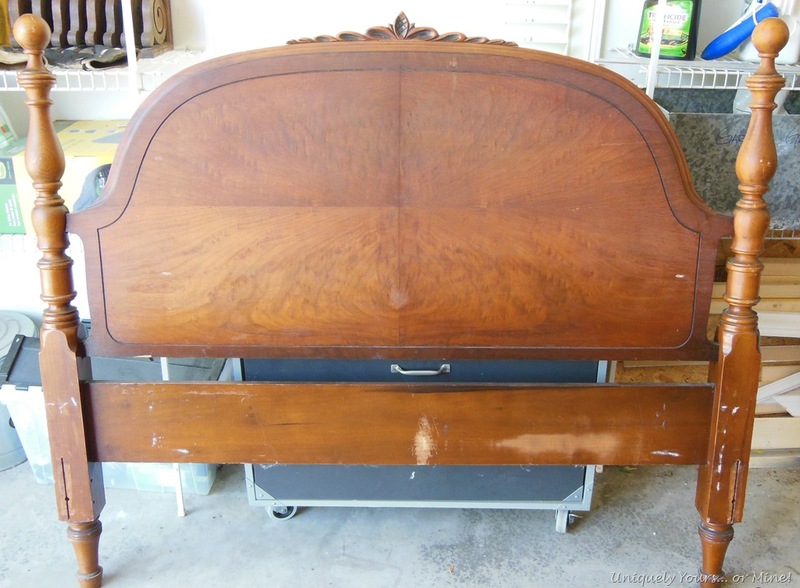 I too just purchased an old sleigh bed on craigslist and the rails didn’t come with it (I wasn’t thinking). Well, guess what… ha! Thanks to you, I now know where to get them. Thanks Hillary! Make sure you printout the template to see if it works with your bed but I’m sure they will! 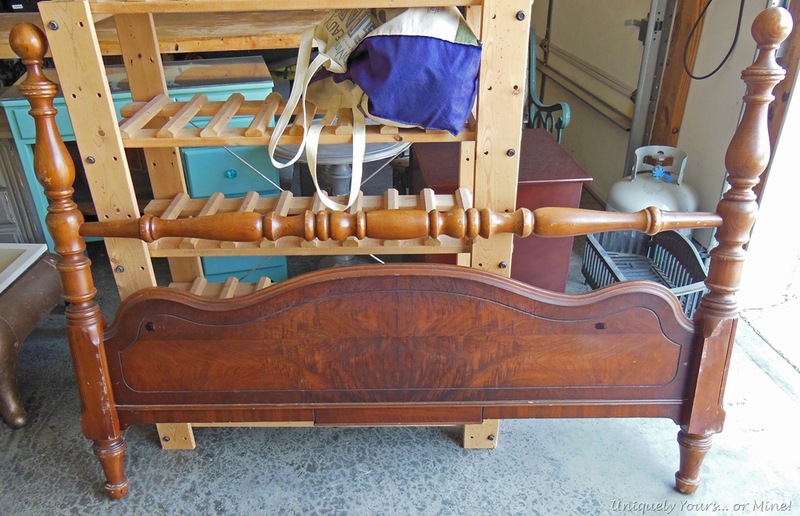 Finding rails to work with vintage beds is a pain which is why I wanted to share the information with anyone who needed it… Hope it all works out for you and thanks for taking the time to comment! Thanks so much Natalie! Hope all is well with you! I’m not sure about cheaper wax but if it were me I would finish it with Watco oil. It won’t be as shiny as wax and is super easy to use. Hope that helps! This bed is a treasure. You did a wonderful job restoring it’s original beauty! I LOVE this bed, Susan! It’s fantastic. If it were mine, I TOTALLY wouldn’t out a bed skirt on it. I know that kills storage underneath, but the legs are so pretty and the lines of the bed are stunning. I would be so tempted to leave it as is. It kind of reminds me of the bed in the bedroom I just did – yours is way nicer, but the lines and style sort of cross. Thanks so much, she does love it! That bed is beautiful!!! So glad you didnt paint it. I think you got it for a pretty good price too! Thanks Susan. You’re right the price wasn’t bad, if the wood rails had done their job, but because I had to buy new rails I think it was a little pricey. I too love painted pieces but especially when mixed with nice wood tones. The bed looks so nice now. Pingback: Teenage Girl Bedroom Makeover | Uniquely Yours... or Mine! Susan this is so gorgeous! 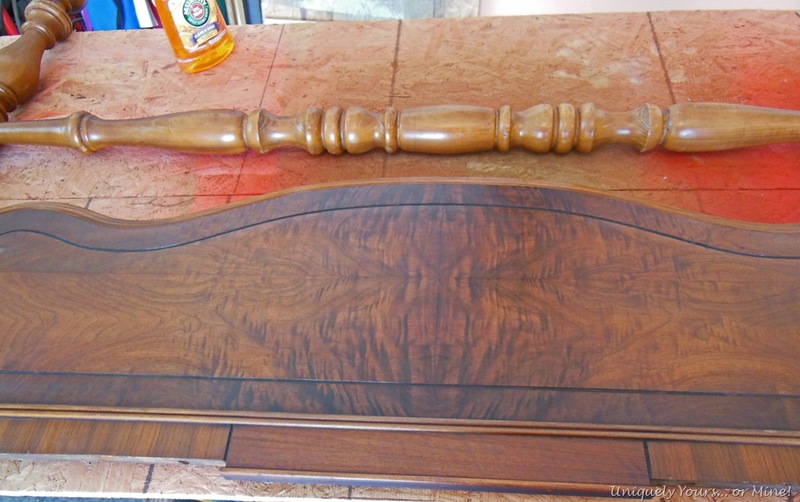 So nice to see a piece of furniture that is not painted! Thank you for linking up at The Handmade Hangout. I am sharing tomorrow at Redouxinteriors. Thanks so much! I try not to paint a piece that can be beautiful left in its natural state. Thanks so much Andi! It really wasn’t too bad of an update and I think worth it!